For your own comfort we ask that you bring a towel, swimsuit and footwear – preferably runners (not flipflops) which will get wet. A wind or waterproof jacket is also advisable and an extra jumper or fleece, for use while on the water, during colder months. We also advise a change of clothing as back up. We meet up by the river and after a brief introductory chat we get changed into our wetsuits. This is followed by a demonstration and safety talk and then for a further 15 minutes or so we will bring you through the basic strokes in an area of calm, sheltered, flat water. After that the real adventure begins. To get the full experience and enjoyment from the trip we spend about 2-2.5 hours on the water. The entire trip from start to finish takes about 3.5 hours. We go out on the water even in the rain. You should consider bringing an extra layer or a waterproof or windproof jacket with you. No. We provide wetsuits for participants but if you do have your own feel free to use it. If you don’t want to wear a wetsuit you can wear comfortable clothing so a change of clothes is necessary, in this instance. You must be prepared for the fact that you may get wet. 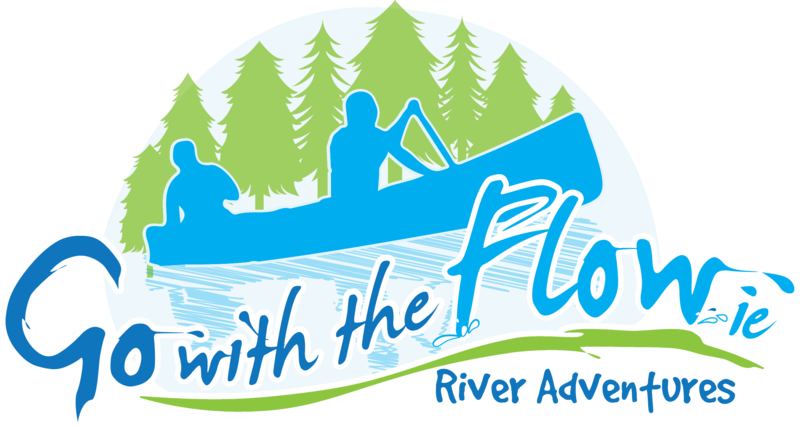 Charlie is a qualified instructor with the Irish Canoe Union and all members of the Go with the Flow team are highly competent in leading excursions. Yes there is white water on the river, but as the river Barrow has a navigation channel on it, there are canals in place at all weirs and rapids, so that those who do not want the challenge of white water can take alternative flat water routes at those points. Yes you can, providing it’s waterproof! However, there’s no need to bring one as we take pictures for you and pop them onto our Facebook site with your permission. Yes. Children should be six years or older and able to swim / be comfortable in the water. They will be wearing buoyancy aids. Will I end up in the same place where I started? Again, because the river Barrow has navigation channels, some of the tours travel downstream and then back up along the canals to where you started. However, tours can be tailored to suit your needs and we can provide pick up facilities at alternative finish points. Go with the Flow carries marine liability insurance which covers us for activities on the water. What types of tours does Go with the Flow provide?While the majority of our tours are half day tours more extensive full day tours are also available. We also provide multi-day trips where overnight accommodation is provided with access to live music and local traditional culture.We provide trips for hens, stags, group weekends away, families, etc. You name it – we can tailor our trips to suit your needs. Where do the adventures take place? Most of our adventures take place on the river Barrow in the Carlow / Kilkenny area. For these events we will meet in the village of Borris, Co. Carlow which is 1 hour from the Red Cow – 20 mins from Kilkenny city or Carlow town. Yes. We highly recommend that you book in advance to ensure that you get the dates you want. Have more questions to ask? We’d be happy to help.